Water is essential to life, but supplies of fresh water dwindle worldwide every day. Here in Stamford, we are fortunate to live in an area well served by reservoirs and wells. Let's use our precious resource wisely and not let it drain away. 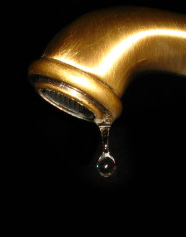 Your water bill -- and hence, your sewer bill -- shrinks. When each of us reduces our water usage, there's more left to go around. The water company pumps out less water, which saves energy during treatment and cleaning. Stamford is a growing city. As new residents and businesses move here, the city's thirst for water will increase. Limit showers to about 5-10 minutes each. Install low-flow showerheads. Look for models rated at 1 to 2.5 gallons per minute (gpm). Some have a "pause" button that you can push to stop the flow while you're shampooing or soaping up. Note that "low flow" doesn't mean "hardly any water." Today's showerheads are built to deliver less water AND provide a satisfying shower. Low-flow showerheads pay for themselves through energy savings within one year. Install aerators on faucets. Some aerators have a lever or button that can be used to stop the flow. Turn off the water while shaving, brushing your teeth or washing dishes. Wash only full loads in your washing machine. If running less than a full load, adjust the water level to match the amount of clothes. Fix leaks. If you can hear your toilet's tank occasionally filling up by itself, you probably need to change the tank's flapper. Reduce water used per flush by installing low-flush tanks. If you have an older model tank, place a plastic bottle filled with water in the tank to limit the amount of water used per flush. Even better, reduce the tank's water level by turning the water level adjustment rod or lowering the clip next to the float cup. Water your plants before 10 am or after 6 pm to minimize losses due to evaporation. Use soaker hoses to water your landscape. Have your car washed at a commercial car wash instead of your driveway. Commercial establishments are more efficient in their use and disposal of water. Click here for more conservation tips from Aquarion Water Company.